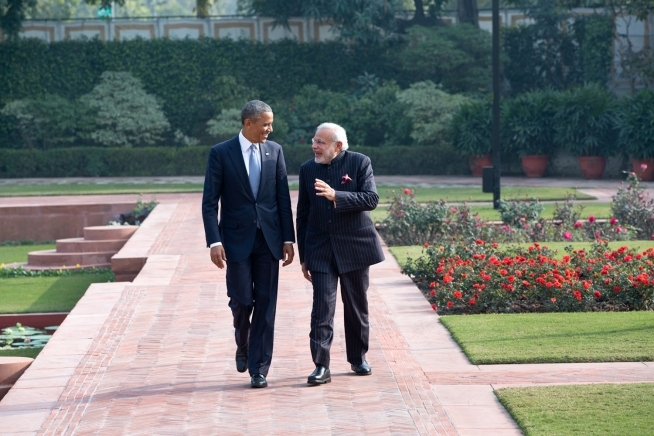 One of the most important US-Asia relationships is that of the US and India. Like the US, India has no territorial claim in the South China Sea. However, because of its size and its location on oil trading routes, India has the potential to greatly impact any strategic balance in the South China Sea region. Image by Pete Souza, public domain. The US is the oldest democracy. With approximately 1.3 billion people, India is the largest democracy. India’s population is currently only slightly smaller than that of the People’s Republic of China, and it is trending to surpass Communist China in 2028. Both countries’ national economies have grown substantially during the past twenty years, but Communist China’s economic growth, much of it fueled by the US and other Western consumers, has outstripped India’s by nearly three times. Indian politicians and business leaders are aware of that, and their desire to increase trade with the West is impacting foreign policy debates in India. While India has no territorial claim in the South China Sea region, it needs to freely navigate the South China Sea to reach markets in South Korea, Japan, the Philippines, and elsewhere. Freedom of navigation in that region directly impacts India’s ability to increase exports and potentially import energy and food. As a result, what happens in the South China Sea matters in the corporate boardrooms of Mumbai and in the homes of the Indian people, giving India a keen interest in the region. Historically, the US and India have always maintained civil, if not always friendly, relations, and most Americans and Indians hold favorable views of each other in spite of the two nations’ other alliances. Shortly after its independence, India established strong diplomatic relations with the USSR, and the USSR, now Russia, has traditionally been India’s biggest supplier of technology and military hardware. India’s close relations with Russia were driven by two major factors. One factor was India’s continuous multi-border disputes with China in conjunction with Moscow’s break with Communist China during the East-West Cold War. The other factor was, and remains, Pakistan. Pakistan vacillates between near-war and low-intensity war with India. That constant hostility has at times been much larger in the minds of Pakistanis than in the minds of most Indians, but coupled with terror strikes by Pakistani-controlled groups, the continuous enmity makes it impossible for Indians to ignore US military aid to Pakistan. In spite of this, most Indians are willing to establish an equitable peace with Pakistan. For Indians, the center of the universe is not located anywhere in Pakistan. For many important Pakistani power brokers, the center of the universe must continue to appear to be in India. By remaining in or near a state of emergency, the Pakistani intelligence establishment and some Pakistani military leaders have been able to maintain an inordinate and unhealthy influence over Pakistani politics. Given India’s conflicts with China and Pakistan, along with US support for Pakistan, it’s easy to understand how India built strong ties with Russia. This may be changing somewhat, but don’t expect a complete halt to the import of Russian military equipment. India has shown a desire to reduce its reliance on Russian military hardware, but its goal is not to replace Russian suppliers with Western suppliers. Its goal is to replace Russian suppliers with Indian suppliers. The trick is, of course, developing adequate Indian suppliers. With a massive labor surplus and high unemployment in India, the political pressure to “buy Indian” is now a major factor in Indian politics. And remember, unlike Communist China, India is a democracy, and the public’s concerns drive foreign and domestic policies. As in other democracies, that linkage is never as direct as the voters would prefer, but no Indian politician can ignore major domestic concerns and survive in office. Ideally, India could do whatever is needed and take however long it needs to accommodate the powerful “buy Indian” agenda. Unfortunately, India is not in an “ideal world,” but rather in a world that finds them next door to Pakistan and the People’s Republic of China – a very “un-ideal” neighborhood, indeed. India has access to European military equipment. To the displeasure of the ruling Pakistani junta, India has now also been granted nearly the same level of access to US-made military hardware as that enjoyed by close US allies. At the same time, for a variety of well-founded reasons, Pakistan has been facing more difficulty in acquiring high tech US military hardware. To the displeasure of US military suppliers, India has yet not showered cash on them. Deals with the US and other Western suppliers are announced with much fanfare. Those deals usually die at the cash register with far less fanfare. In one concrete sign of closer US-India relations, India and the US are “cooperating” in the construction of new Indian aircraft carriers and other new Indian Navy ships. What “cooperating” will end up looking like precisely is difficult to say, but if real cooperation occurs in these projects, then that may be a clear indicator of growing ties between India and the US. It’s not surprising that in a nation of 1.3 billion people, not everyone agrees about the direction that Indian foreign policy should take. China and Russia’s willingness to improve their relations enough to forge a massive natural gas deal has many Indians wondering about the possibility of improving relations with China and eventually receiving much-needed natural gas from Russia via Chinese pipelines. China is currently paying much less for Russian natural gas than India is paying for Middle East natural gas. On paper, the concept of a Russia-China pipeline looks good to India, unless that paper is being viewed in China. China had a huge motive for accepting a gas deal from their old enemies to the north. China feels fragile and insecure about its short term and long-term energy needs. And it should. Increased energy costs could throw the Chinese economy into near chaos. Helping India gain access to cheaper natural gas would make India a competing consumer for Russian natural gas. It would also help India realize its dreams of military modernization, and it would help that country compete for a larger share of Western export markets. China wants to help India improve its military and its economy about as much as I want to live in Syria – not one damned bit. Overall, we will likely see closer economic and military ties between the US and India, but it will not happen overnight. Most Indians are politically rational. They neither wish to become “pro-American,” nor “pro-Western.” They simply wish to find a way to be effectively “pro-Indian.” India’s desire to pursue a pro-Indian agenda in no way conflicts with US or European goals in Asia. While it is unlikely that India will want or be able to exert much military influence in the South China Sea over the next decade, India remains a critical factor for any Chinese military strategy. Just as India needs to freely navigate the South China Sea, China even more critically needs to navigate the Indian Ocean. The world champion diplomatic double talkers in Beijing love pretending to ignore India’s influence in Asia. That plays well to the captive Chinese audience, but not so well in the geopolitical reality. India’s slowly growing strength in the Indian Ocean will act as an indirect but strong deterrent to Communist China’s escalation of hostilities in the South China Sea. In our next article we will consider the overall geopolitical realities in the South China Sea.